(HONOLULU) – Lehua Island’s natural ecosystem supports one of the largest and most diverse seabird colonies in the main Hawaiian Islands. This includes the International Union for Conservation of Nature (IUCN) Red List Endangered Newell’s Shearwater and two IUCN Near Threatened Species, which are also U.S. Federal Species of Concern, the Black-footed and Laysan Albatross. In all, 17 seabird species and 25 native or endemic plants (occurring nowhere else in the world) inhabit the steep, rocky, windswept slopes of this tiny island. Next week, the Department of Land and Natural Resources (DLNR) Division of Forestry and Wildlife (DOFAW) along with the diverse Lehua Island Restoration Steering Committee (LIRSC-see representatives listed below) will release a Draft Environmental Assessment (DEA) to gather public comment for a proposed conservation intervention that will continue the restoration of Lehua Island. There will be a public informational meeting on the Lehua Restoration Project on Tuesday, March 14, 2017 from 5-7 p.m. at the Waimea Neighborhood Community Center. 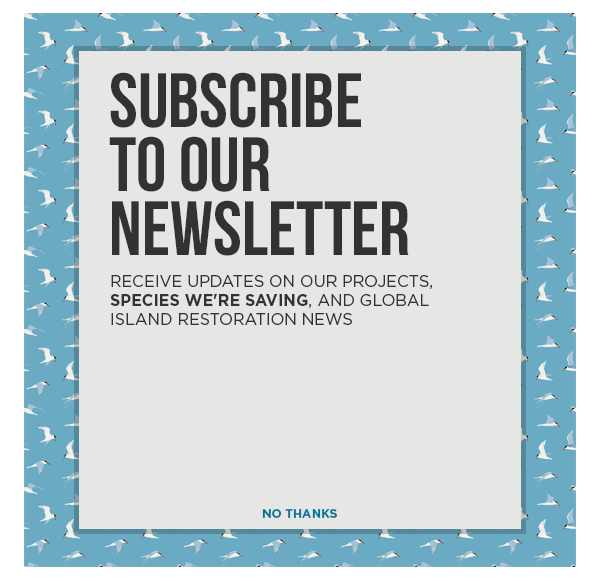 The purpose of the project is to restore the Lehua Island ecosystem by creating a predator-free, fully-protected refuge for threatened and endangered Hawaiian species. The invasive rats have far reaching impacts on the island’s native birds, plants, and natural systems. Chiefly, they eat native seabird eggs, chicks, and adults. They also consume and destroy the island’s native plants and seeds. Left unchecked, invasive rat populations can explode, with females having as many as 8-12 offspring every 30 days. Every rat must be removed, otherwise one rat and its progeny could colonize and infest a small island, like Lehua, in a matter of months. After an exhaustive evaluation of more than 500 successful rodent eradications worldwide and the best scientific publications regarding island invasive species eradications available, the LIRSC determined that the only feasible method of eradication is to apply a conservation bait containing rodenticide. This is because of Lehua Island’s size, remoteness, and dangerous terrain. Virtually all previous successful eradications on islands with similar challenges have applied this same conservation method. The bait will be applied to Lehua Island by helicopter with supplemental hand applications. Two anticoagulant rodenticides are being considered, both of which are authorized or will be authorized and registered by the U.S. Environmental Protection Agency for such conservation applications. The rodenticides are Diphacinone and Brodifacoum. They are used commonly by the global conservation community to remove invasive rats and mice from islands. Locally, this includes the successful eradication of rats from Mokapu islet near Molokai. Once rats are confirmed to have been removed from the island, no additional rodenticide will be needed. The proposals recommend at least three bait applications applied a few days or weeks apart during an operational window of July through September. Bait densities have been studied to ensure sufficient rodenticide is available to every rat. Any residual bait quickly deteriorates in normal environmental conditions. The rodenticide is not water soluble and any residual bait in the environment will break down, over time, to its base components of water and carbon dioxide. The primary risks of the rodenticide application are the potential rodenticide exposure or disturbance to non-target species, along with inherent safety risks from field operations to project staff. The land managers and LIRSC take these risks very seriously and developed plans to use proven strategies that will avoid, minimize, and mitigate risks whenever possible. These include avoiding the seabird breeding seasons, following permit restrictions, and careful application of bait by State of Hawai‘i-certified pesticide applicators. The project aims to use the smallest amount of rodenticide to maximize potential for a successful rat eradication while minimizing risks to other species. The magnitude of risks to non-target species and people is considered low while there is incredible potential for long-term conservation benefits to the island’s unique diversity of seabirds and plants. The Draft Environmental Assessment (DEA) will be made available for review and public comment for 30 days beginning March, 8, 2017 via the Hawai‘i Office of Environmental Quality Control: http://health.hawaii.gov/oeqc/. There will be a public informational meeting on the Lehua Restoration Project on Tuesday, March 14, 2017 from 5-7 p.m. at the Waimea Neighborhood Community Center, Kauai. Representatives from the following multidisciplinary conservation, community stakeholder groups and agencies support and advise the project management team for the restoration of Lehua Island. They comprise the Lehua Island Restoration Steering Committee. Other project supporters include the Kaua‘i Endangered Seabird Recovery Project, Pacific Rim Conservation, National Fish and Wildlife Foundation, Bell Laboratories, and the David and Lucile Packard Foundation. The partners and supporters especially acknowledge the contributions of the owners of Ni‘ihau and the Ni‘ihau community in helping to evaluate this restoration opportunity. Lehua Island, Hawai‘i is located about 19 miles (30.6 km) west of Kaua‘i and less than a mile north of Niʻihau. It is a 111 hectare, crescent-shaped, and uninhabited island administered by the U.S. Coast Guard and managed by the Hawai‘i Department of Land and Natural Resources as a State Seabird Sanctuary.